Don De Rosa, who owned radio stations in Fulton twice during a long career highlighted for his love of ethnic and oldies music, died Saturday in Syracuse. De Rosa, of Cicero, was 69. (Read his obituary here.) He had recently been diagnosed with cancer.Â His death occurred on the same day that friends gathered to raise money for his treatment. 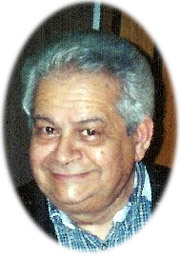 De Rosa was known to generations of radio listeners as Polka Stoney, his persona for his polka music programs, or Cumpari Joe on his programs of Italian music. He owned Fulton’s WOSC and WKFM in the 1980s.Â He returned to Fulton in 2002 to buy the AM station, then called WZZZ, which he renamed WAMF.Â De Rosa owned the station when its studio was destroyed by the fire that destroyed Fulton Tool Company. De Rosa had worked at or managed radio stations in Utica and Albany as well. The sign outside Fulton’s Sweet Inspirations Drive-In mourns De Rosa’s death.Â He spun oldies music for restaurant events.Â A note on the guestbook at his funeral home obituary also mentions his time playing oldies music at the Oswego Farmer’s Market.